Tickets are available at the door: donation $15 ($10 seniors, students and JPTC members). Space is limited; reservations are suggested—call 617-524-3158 or email lghouseconcerts@aim.com. 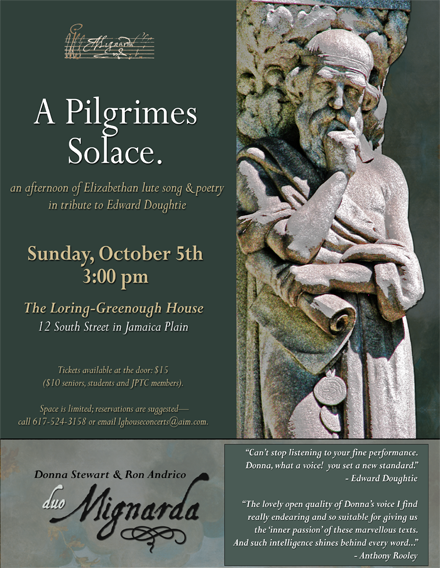 Mignarda returns to the Sunday Afternoon Parlor Concert Series at the Loring-Greenough House, the last surviving 18th century residence in Sumner Hill, a historic section of Jamaica Plain, Massachusetts. Built in 1760, the venue listed in the National Register of Historic Places and has been a historic house museum since 1926. Its beautiful period decor and intimate size make it an ideal setting for lute song.